Developing a file structure is one of the first steps in creating your workflow. Whether youre using Lightroom to manage your library or Bridge to view folders of photos, its much easier to find a specific photo if you use a descriptive filename. 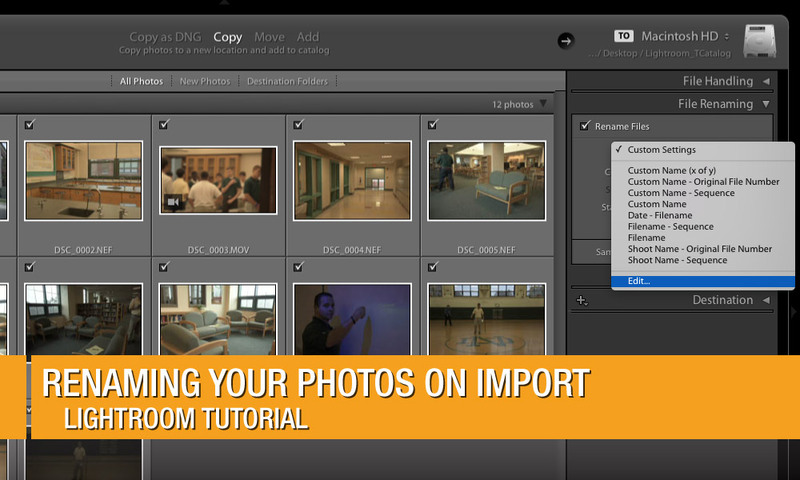 Adobe Lightroom offers a really easy way to rename your photos on import. Inside the Lightroom import window, open the File Renaming panel on the right side. Put a check where it says Rename Files. We can choose one of Lightrooms built-in templates by clicking on the Template dropdown. Lets choose to build our own template, so click on Edit. Inside the Filename Template Editor, we can customize our template. At the bottom of the window, find Custom Text and choose insert. This will let us add custom text from inside Lightrooms Import Window without needing to change the template. Then I added an underscore by pressing Shift-Hyphen. Each image needs a sequence number, so under numbering choose the Sequence # dropdown and make sure it has 4 digits (0001). This is so we can import up to 9999 images at one time without a duplicate image number. Click Insert to add it to the template. Take a look at the example filename near the top of the window and make sure thats how you want it to look. If its good, then click Done. With Custom Settings selected as the Template, we can add Custom Text. I like to add a reverse date (2014-09-16 or 20140916) and then the name of my photo shoot. Adding a hyphen or underscore helps to separate the file name, without putting spaces in the name. We can also change the Start Number, which is helpful when importing multiple cards. Check the Sample text and make sure it looks good. Then give the photos a destination and click Import. With renamed and organized files, I can easily search and find anything I need from my library in just a few minutes. If you want to learn more about Conquering Lightroom’s Import Window, check out this post by Vanelli. If you use Bridge in your workflow, click here to learn how to batch rename your photos with Adobe Bridge. To make it even easier, you can add a date string from the import function instead of having to type it out each time – it just grabs it from the EXIF. That’s a great tip, as long as you keep your camera date and time updated!